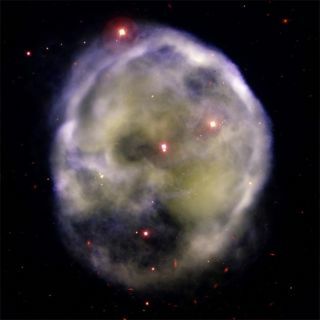 A Gemini South image of the planetary nebula NGC 246, or "Skull Nebula." For the ancient Greeks, the heavens were populated by stick-figured gods, animals and creatures of myth. An active imagination and a human knack for seeking patterns where none existed led them to group pinpricks of light into sword-wielding hunters, menacing lions and centaur archers, among other things. Imagine what they might have seen if they'd had telescopes. From horses and insects to space storms that resemble terrestrial tempests, astronomers peering up at the night skies today are doing with nebulas, galaxies and exploding supernovas what the ancient Greeks did with stars. Last week, NASA released new images of NGC 246, whose ominous look has earned it the nickname "Skull Nebula." The image shows what the outer atmosphere of a dying star can do as it travels swiftly through a thick cloud of interstellar gas. Other well-known and oddly familiar shapes in space include the equine profile of the Horsehead Nebula, located in the Orion Constellation, curvy MyCn18, better known as the "Hourglass Nebula," and the intricate remains of a star explosion seen from Earth in 1054 A.D. and now called the Crab Nebula. Astronomers have sighted nebulas that look like translucent bugs, such as the Butterfly Nebula, the Ant Nebula and the Tarantula Nebula. The Cone Nebula could be seen as a giant tubeworm filter-feeding on stars and nebula NGC 2392 is a dead ringer for a chilled Eskimo hooded in a fur-lined parka. Telescopes equipped with sharp eyes and X-ray vision have picked out twisted clouds of interstellar gas that have been dubbed space tornados, coiled cosmic slinkys and galaxies eerily reminiscent of the burning Eye of Sauron from Tolkien's Lord of the Rings. There is also Messier 104, a galaxy that could be mistaken for a Mexican sombrero when viewed edge-on. And two galaxies passing each other in the direction of the constellation Canis Major haunt humanity with the tawny eyes of an owl. The Hubble Space Telescope has captured images of grouped galaxies that look like seashells strewn atop black sand and revealed a quartet of blue stars in Orion that sparkle like sapphire gems. There's more to it all than wild imaginings though. The same images that instill awe and remind us of the familiar also reveal the fates of galaxies and the secrets of star birth and death.